Innovative research, expert patent litigation, drug discovery and development – Dr. Rashida A. Karmali can do it all. Renowned for her prowess across a variety of professional mediums, she has thrived as she combines her passions to head Tactical Therapeutics, Inc. (TTI), a privately-funded clinical research company looking to lead the fight against Glioblastoma (GBM). Dr. Karmali founded the business to bring a new anti-cancer compound, CTO, to patients after her research led to its production. The drug is much needed, as GBM is a particularly difficult cancer to treat, represents 50 to 60 percent of adult primary CNS tumors, and has a high mortality rate. Dr. Karmali’s therapeutic discovery is still undergoing trials, but has thus far shown to “block out multiple pathways of cancer proliferation and metastasis, preventing the number one problem in cancer today, resistance and recurrence of tumors.” This has the potential to revolutionize treatment options. Dr. Karmali’s journey toward this momentous breakthrough started at the University of Newcastle upon Tyne, where she earned a PhD in biochemistry in 1976. She proceeded to complete postdoctoral training and research in tumor immunology at the Memorial Sloan Kettering Cancer Center, after which she spent five years running a research lab as an associate professor at Rutgers, The State University of New Jersey. During this time, Dr. Karmali carried out studies on the role of eicosanoids and polyunsaturated fatty acids in cancer and in autoimmune diseases. Notably, her work on Omega-3 fatty acids and COX2 in particular led her to be recognized on the cover of Cancer Research in 1997. Although those experiences helped her build her expertise in cancer inhibition mechanisms and earned her much acclaim, Dr. Karmali still wanted more. She decided to refocus her energies on law, which, combined with her previous excellence in scientific research, made her the perfect person to represent high-profile pharmaceutical companies with patents. Dr. Karmali’s work led her to join companies like Pennie & Edmonds LLP and Strook Strook & Lavan LLP, and allowed her to become familiar with the new advances in drug protection processes. Thus, when she was working for a client with a promising new drug, she knew enough about both sides of the industry that she was able to develop it and patent it herself, and TTI was born. 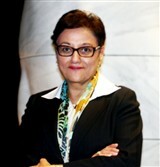 With her guidance and background, TTI has accrued six U.S. patents and 63 foreign patents since its inception in 2005. To prepare for her endeavors, Dr. Karmali obtained a Master of Science in animal nutrition from the University of Aberdeen, a Bachelor of Science from Makerere University in Kampala, Uganda, and an MBA from Rutgers, The State University of New Jersey. She also holds a JD from Rutgers Law School, and is registered to practice in New York. She maintains a connection to her peers through her memberships with the American Association for Cancer Research, the American Cancer Society, and the American Society of Clinical Oncology, among other organizations.